Measure 3 cups heavy cream into a saucepan. Split the vanilla beans lengthwise and scrape out the seeds using the dull edge of a knife. Toss the seeds and the vanilla beans into the heavy cream. In dire circumstances, you could use pure vanilla extract instead, but honestly, if you're going to the trouble of making this dessert, you really should have vanilla bean speckles in it, right? Bring the cream and vanilla to a light simmer, not to a boil, just so that some bubbles appear around the edges of the pan. Remove from heat and let stand for 20 to 30 minutes. Separate 8 egg yolks into the metal bowl of a stand mixer. Add 1/2 cup sugar and blend on high until the egg mixture is pale yellow and fluffy (see image above). Strain the cream mixture to remove all the vanilla beans and floaters. Turn the mixer mixing the egg yolks on to low and slowly pour about 1 cup of the of the cream into the egg mix. This will temper the yolk mixture and allow to adjust to the heat of the cream without cooking the eggs and giving you a scrambled egg mixture. After a minute of mixing, go ahead and pour the rest of the cream into the egg mixture and blend on low so the cream and eggs are mixed well. Making sure your combined egg/cream mix is in a metal or glass bowl, place the bowl over a pot of simmering water, making your own double boiler. Let the mix cook for about 30-40 minutes, stirring frequently. It's kind of tricky to know when the custard mix is done, but it needs to be pretty thick, so that when you dip a spoon in there, the mix should cling to it and coat the spoon well. The mixture will set up when it's chilled, but make sure it's got a good custard consistency to it. Strain the mixture again to eliminate any lumps (heaven forbid). Cover the custard with some plastic wrap, but put the plastic wrap directly on the custard to prevent a skin from forming. Chill for 6 hours or overnight. In a food processor, blend the flour, salt and sugar. Add butter and blend until the flour mixture is lumpy and the butter is all chopped up in small pieces. Mix the egg yolk, water and vanilla in a small bowl. Turn the food processor on and add the liquid. Blend until a ball of dough forms. The dough will be easier to work with if it is chilled, so you should throw it in the fridge before you start rolling it out. 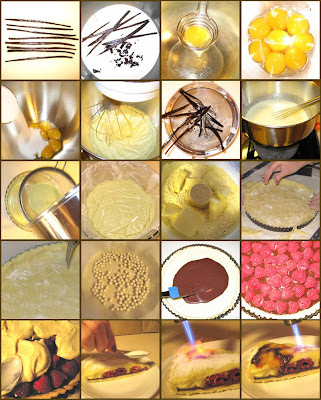 Grab a tart pan (which is one of the coolest inventions ever) and get a rolling pin and roll-pat or pastry cloth. Roll out the crust and transfer it to the tart pan. Mold into place by hand. With a fork, prick the bottom of the tart crust as shown above. Put a piece of parchment paper over the crust and add some pie weights (pennies or uncooked pinto beans work great as well). Cook crust for 15-18 minutes, then remove the parchment and pie weights and cook for 5-6 more minutes so the crust will brown. Bring the cream to a boil. Remove from heat. Add chopped chocolate. Let sit for 2 minutes. As soon as the chocolate is melted, stir vigorously until you have a nice creamy chocolate mix. Spread the chocolate mixture in the bottom of the baked tart crust. Cover the chocolate layer with fresh raspberries. Top the fresh raspberries with the chilled Crème Brûlée custard. Chill until you are ready to serve. Sprinkle a little super fine sugar over the top of the slice of tart. Light up the torch and hold the flame to the sugar on top until it turns brown and caramelizes. Serve immediately.